Here's a list of the quintessential Penang experiences that every first-time visitor should try. Follow the links to explore our resources and know more to plan your perfect holiday on Malaysia's hippest island. First time in Penang and you don’t know what to do? 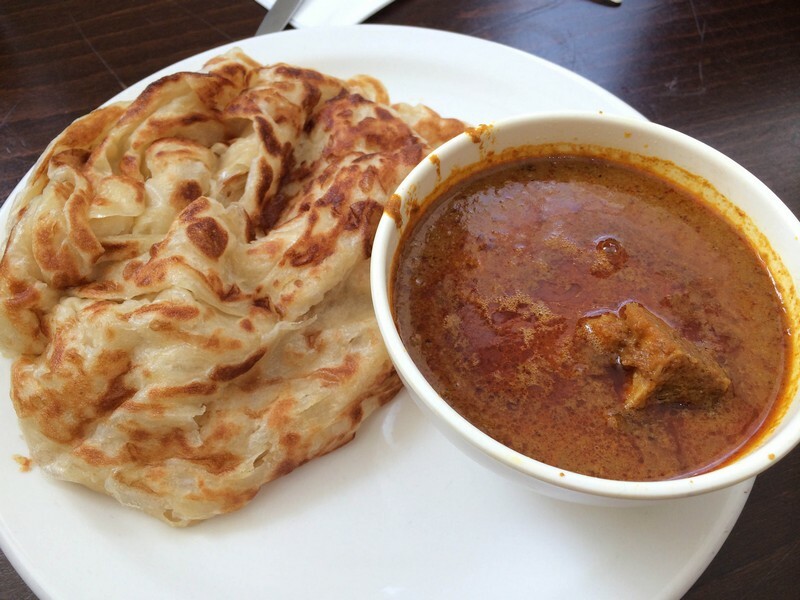 This page is a directory of all the essential things to do in Penang. 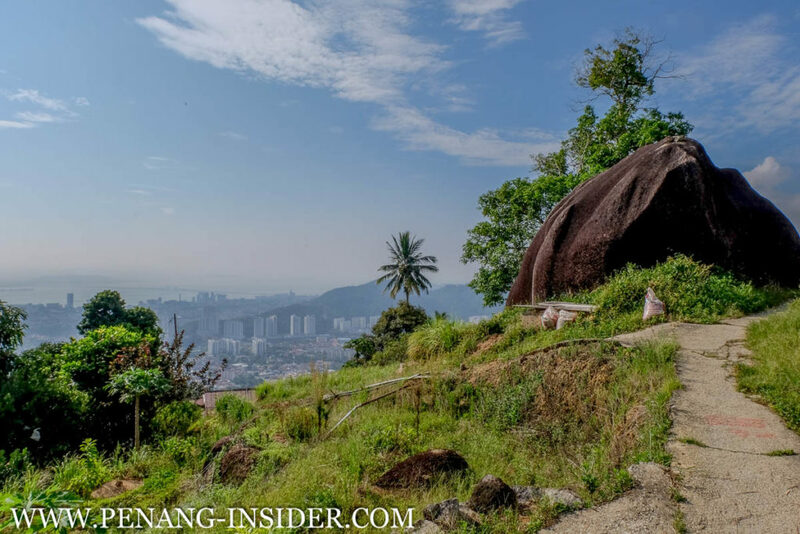 Start here if you want to have a quick overview of what you can see and do in Penang: you can follow the links we provide to read other articles that will give you much deeper details on the best places, food and experiences that are waiting for you in George Town and Penang Island. Penang most striking temple is Kek Lok Si, perched on a side of Penang Hill, and hosting a 36.57mt-high statue of Goddess of Mercy Kwan Yin. 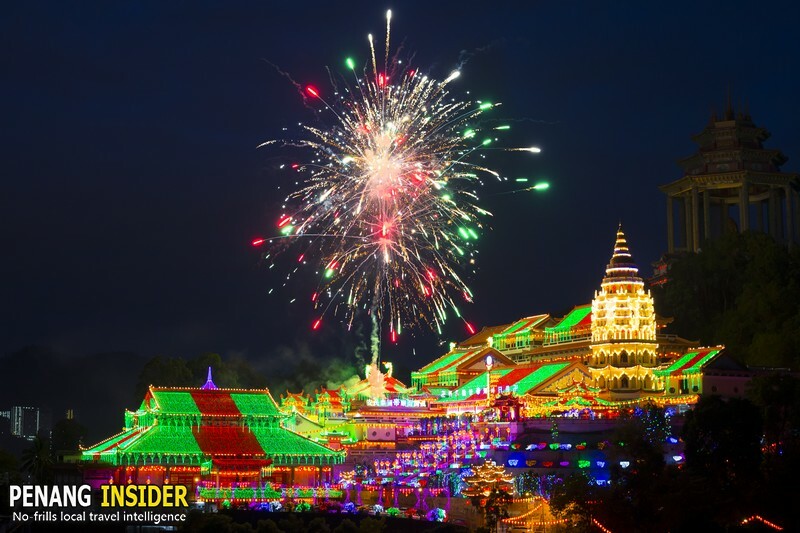 It’s the largest Buddhist Temples in Malaysia and one of the biggest in Southeast Asia, and it’s particularly nice to visit right before Chinese New Year (in Jan/Feb every year) when it’s decorated with hundreds of beautiful red lanterns and colourful LED lights. In George Town proper is the Goddess of Mercy temple. Fronted by a square where devotees go to pray and light up joss sticks, it’s one of George Town’s oldest temples, built in 1728. Legend says that during the Japanese occupation of Penang in World War II, no bomb could ever destroy it, because of Kwan Yin goddess’ protection. 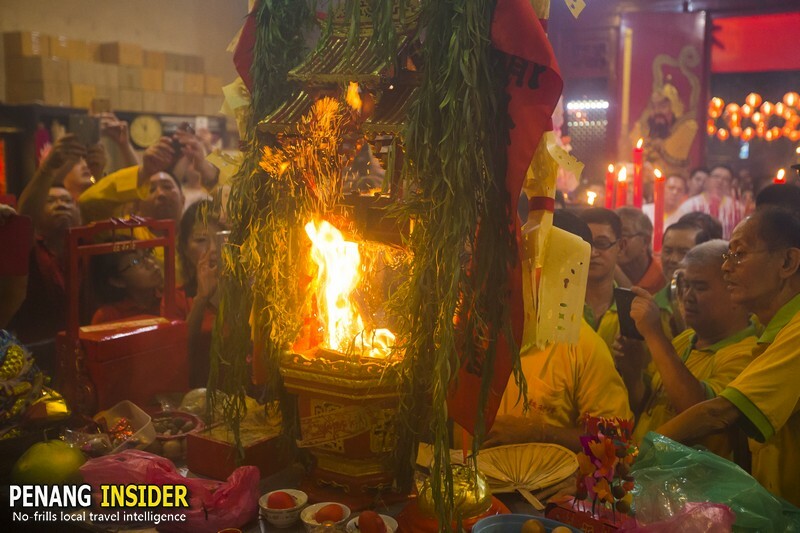 The Thai Pak Koong in Tanjung Tokong is another interesting temple where you can see the “ritual of the flame”, or Chneah Hoay, when priests predict Penang’s economic performance for the next 12 months by lighting up a fire and observing the movements of the flames. Thai Pak Koong sits next to one of the island’s newest attraction, the Penang Avatar Secret Garden, and is a very good spot to see the sunset over the sea. The Chinese community played a strong role in building up George Town as we can see it today. From the mid 19th to 20th century, Clan Houses were the places where fresh immigrants from southern Chinese went to find help and comfort as soon as they disembarked in Penang to find new fortunes. There are five main Hokkien clan associations in Penang, namely the Khoo, the Lim, the Tan, the Cheah and the Yeoh. Many of these ancestral houses are still preserved in George Town, and you can visit them easily. Head down to Armenian Street and the cluster of roads surrounding it, where some of them are. Three of these clan houses are particularly striking and easy to access: the obvious starting point is Khoo Kongsi, a large Chinese clan house in Cannon Square, with a unique roof architecture and elaborate carvings and decorations. It’s probably the grandest clan temple in Malaysia, and one of Penang’s main historic attractions. Seh Tek Tong Cheah Kongsi, at the end of Armenian Street, has been recently renovated and has a quiet, serene garden and a beautiful main hall with an open terrace with an altar and filled with carvings on the first floor. Many tourists may stumble directly upon Ng Fook Thong Temple, as it sits at a corner of Chulia Street, George Town’s main backpacker area. It has excellent paintings of Celestial Guardians on its doors, which open onto a large, peaceful inner courtyard. There are many other clan houses in the streets of old George Town, and all are open to visitors. Food is a great part of the Penang experience and you’ll find it everywhere. The beauty of Penang food is its mix that goes back to the island’s multi-ethnic origins: it’s a blend of Malay, Indonesian, Chinese and Indian cuisines. It caters perfectly to vegetarians and vegans (there are plenty of such choices, especially among Chinese foods, and during religious festivals). After Penang’s inscription as a UNESCO World Heritage Site and its rise as one of Southeast Asia’s major centres of arts, Penang food scene has upholstered itself and you will be able to find many upscale restaurants serving most of the world’s cuisines. But what Penang is really famous for is its wide choice of hawker food — meaning street carts, often attached to bicycles, and used to dish up food. Believe it or not, Penang street food is fresh, hygienic because prepared on the spot, and a quintessential part of the Penang experience. You can have a full meal for a mere RM5/USD 1.25, and the choice and variety of foods and cuisines is just mind-boggling. Start familiarizing yourself with 26 essential Penang dishes, and 80 places where you can eat them. Say Penang, and most of the visitors think of its world-famous street art. 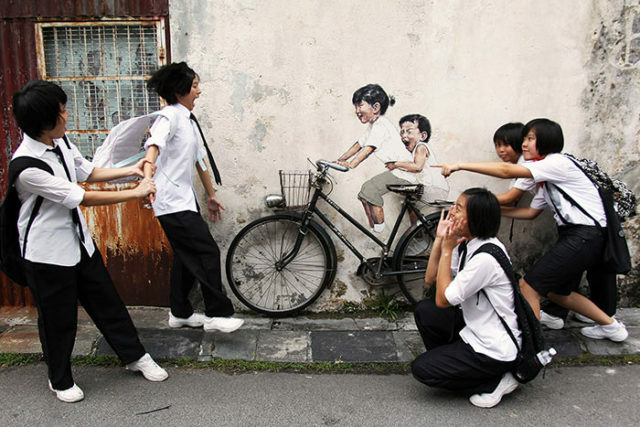 The phenomenon started in 2012 when Lithuanian artist Ernest Zacharevic etched the first series of 6 mural installations as part of the George Town Festival. 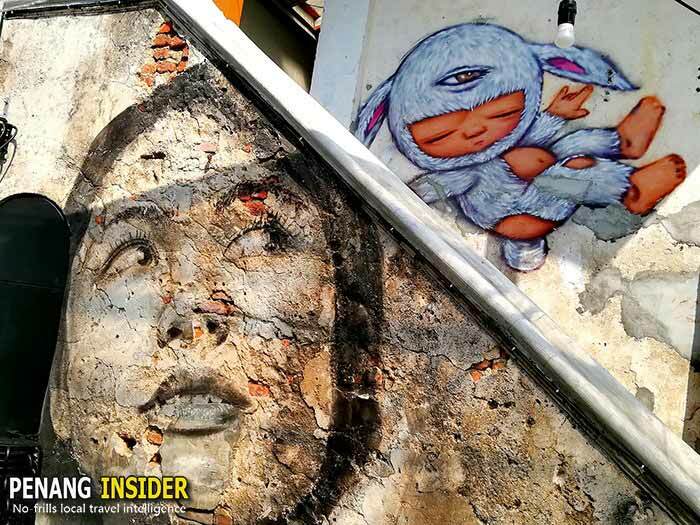 Since then, Penang has used street art to revive its reputation, put itself on the tourist map, and attract even more visitors. The problem is that these days, more people come to Penang for the street art rather than for its rich multi-cultural history and unique traditions — quite sad, but how to cure the hip-steria? You can see over 100 murals in Penang, some of which depict old Penang traditions, a series of women, and even the cats of Penang. 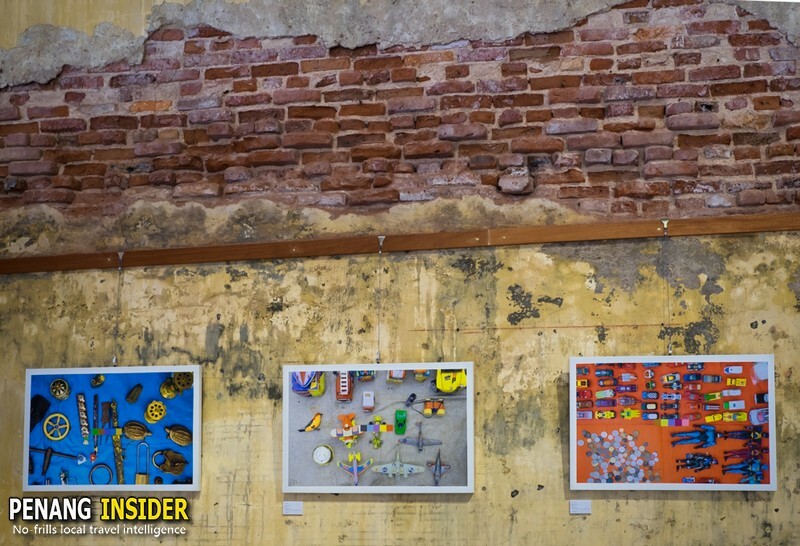 Art is also a vibrant part of Penang’s underground, and it’s easier to mingle with local artists in George Town than in most other art cities around the world. People in Penang are just happy to share and chat: there are several cafes and bars where you can rub elbows with creatives and get to know more about upcoming art events, exhibitions and meet-ups. Penang and George Town are also a perfect destination for families with children. It’s true, the beaches are not the best in Southeast Asia, but there is plenty of nature and other interesting activities for kids of all ages. Whether you visit Penang for the first time, or you are a frequent visitor, this list of 32 things to Do in Penang with Kids will give you plenty of inspiration for your family time on Penang island. Penang is also a modern island filled with amenities and a great variety of shopping options. There are many shopping malls, including some of the biggest in Asia. You will find all the popular designer brands, upscale eateries serving a range of Western and international cuisines, bookshops and everything else you are used to finding at home. On weekends, shopping malls become popular hangout places for locals who love to come here and bask in the air-conditioned comfort, loving to see and be seen. And even if designer brands and upmarket poshness is not what you are looking for, Penang has certainly other shops and markets worth browsing. If you are an artsy type, you shouldn’t miss the Sunday Pop Up Market at Hin Bus Depot. Little India is another good spot to shop for bargains, for it has several streets lined with local boutiques where you’ll find much more than Indian-styled clothes and aromatic incenses. In Penang, it’s quite easy to strike off the beaten path as most tourists end up spending all of their time in George Town, and specifically only in its tourist ghetto — the two main central roads Chulia Street and Love Lane. There’s no harm in doing that, except for the fact that you’ll miss on so many other things available on the island. For example, Penang is famous all over Asia for being a destination for medical tourism: if it’s health and fitness that you are interested in, there are several interesting activities, from yoga to flotation therapy, available in Penang. Penang island has many different areas you should get acquainted with before deciding where to base yourself. It has one of the world’s smallest National Parks, and plenty of open spaces and nature in the southwestern corner of the island, Balik Pulau. Many come to Penang and end up overwhelmed by George Town, without ever experiencing anything else. We think George Town is good for a couple of days, but then you should move on and explore the rest of the island. Hiking is a great way to get to know Penang nature and discover the island’s more natural, relaxing side. For starters, you should hike to Penang Hill, at least up to the cable car’s Middle Station. It’s an easy hike along a paved trek that offers great views above Kek Lok Si Temple and the Strait of Melaka. Find a full itinerary of Penang Hill Middle Station hike here. Another popular Penang Hill hike starts at Moon Gate, the former entrance to a millionaire’s home. You can follow a concrete staircase up to the hill, which we don’t recommend, or strike off on very interesting hidden jungle paths. Read how to hike to Station5 through the jungle here. After you have been on Penang Hill’s hiking trails, other choices for nature lovers lay just nearby. On top of Penang Hill’s itself is the Habitat, an interesting forest walk along a colonial irrigation path that crisscrosses the hill’s best-preserved patch of rainforest. There are at least 7 good reasons why you should visit the Habitat Penang Hill. Their latest addition, the 5-course Flight of the Colugo zipline, is also a fun-filled activity that’s highly recommended. At the bottom of Penang Hill, and in walking distance from Moon gate, are the Botanical Gardens. 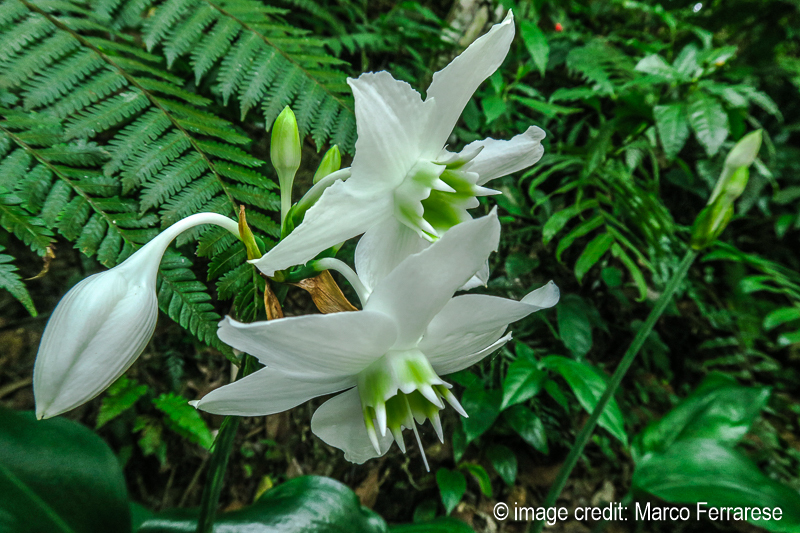 They are also only about a 10min drive from George Town — you can take a Grab car there — and the perfect place to stroll and observe some of the region’s, and the world’s, flowers and trees. The circular road that goes around the Gardens is a popular jogging track, especially before sunset. By far, the island’s most natural area remains Balik Pulau in the southwest corner of Penang. This is where you will find fishing villages, unspoilt beaches, a lot of nutmeg, durian and banana trees, and a pace of life which is the opposite of hectic George Town. Balik Pulau is ideal for cycling and relaxing, and also has a couple of hiking trails, such as the 3-mile circuit at Kalan Pondok Upeh. It’s a good idea to base yourself here if you are looking for a quiet and more natural experience of Penang island. Read this post for a free two days itinerary in George Town. It covers the basics of exploring the town, tasting the food, and getting your feet wet in some of George Town’s most interesting nightlife and artist haunts. With three days in Penang, you may visit George Town and also strike off to the southern coast and explore the markets and beaches of Balik Pulau. It’s a much different experience compared to George Town, with plenty of opportunities to see natural scenery, paddy fields dotted with swinging coconut trees, and even a few very interesting beaches. Next articleThe Best Steamboat in Penang? Give Hong Kong-style Chicken Pot a try.